High above the bed of the Tolminka River, there is a wooden sacred place, the Memorial Church of the Holy Spirit in Javorca, which bears the European Cultural Heritage label. The church celebrates the fallen Austro-Hungarian defenders of the Isonzo Front battlefield (1915–1917). As the most beautiful World War I memorial in the area of the Republic of Slovenia, it was placed on the list of particularly important European historical and cultural heritage back in 2007. The Church of Holy Spirit in Javorca was built by Austro-Hungarian soldiers, masters of various crafts. It stands as a symbol of a call for reconciliation and a witness to the connecting strength of joining the artistic creation with construction. There is a bell tower with a solar clock, the coat of arms of the monarchy and the inscription PAX (peace) above the entrance. The exterior is adorned with coats of arms of the twenty lands, which formed Austria-Hungary, whereas the interior is decorated with oak pannels, which symbolise pages of a memorial book, with 2,564 names of fallen Austro-Hungarian soldiers who died in the nearby battlefields. Their names were burnt into wood according to the system of the military hierarchy. The plans for the church, which celebrated its one hundredth anniversary of construction in 2016, were created by Remigius Geylinga, a painter from Vienna, who was a senior lieutenant back then. The construction was led by Géza Jablonszky, a lieutenant of Hungarian origin. It was thoroughly renovated in 1934, in the beginning of the 1980s, in 2005 and in 2016. The Church of the Holy Spirit in Javorca will not only enthuse you with its historical message and incredible construction. From the terrace next to the church, there is a view of the mighty Rdeči rob, the charming chain of the Tolmin – Bohinj mountains. 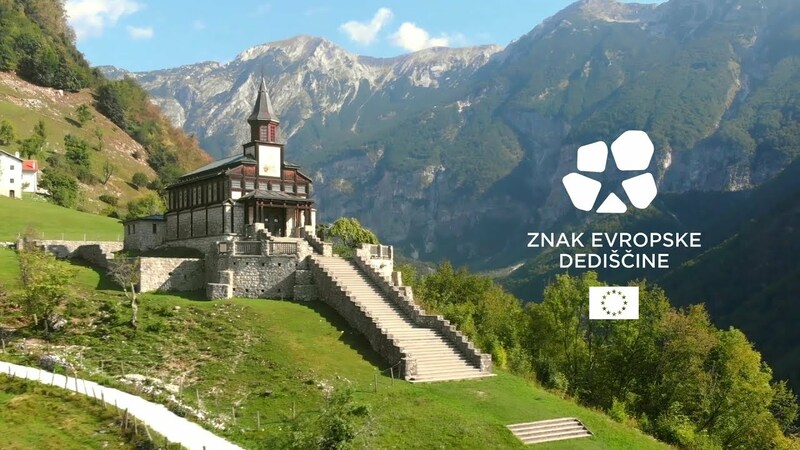 The church is one of the selected points on the famous Walk of Peace trail, which connects memorials and remains of World War I in the Soča Valley. 16. 4.–31. 5. Saturday, Sunday, holidays 10 a.m. - 5 p.m.
1.6.–16.6. Every day, 10 a.m. - 5 p.m.
17.6.–31.8. Every day, 10 a.m. - 7 p.m.
1.9.–17.9. Every day, 10 a.m. - 5 p.m.
18.9.–1.11. Saturday, Sunday, holidays 10 a.m. - 5 p.m.
High above the bed of the Tolminka River, there is a wooden sacred place, the Memorial Church of the Holy Spirit in Javorca, which bears the European Heritage label. The church celebrates the fallen Austro-Hungarian defenders of the Isonzo Front battlefield (1915–1917). As the most beautiful World War I memorial in the area of the Republic of Slovenia, it was placed on the list of particularly important European historical and cultural heritage back in 2007 and received European Heritage label in 2018. Since the beginning of 2018, the Memorial Church of the Holy Spirit in Javorca is officially among the giants of the European Heritage, which emphasize common European values. In 2018, it was formally awarded a special recognition by the European Commission - the European Heritage Label. 30. 3. – 26. 4. Saturday, Sunday, holidays 10 a.m. – 5 p.m.
27. 4. – 5. 5. Every day 10 a.m. – 5 p.m.
6. 5. – 17. 5. Saturday, Sunday, holidays 10 a.m. – 5 p.m.
18. 5. – 14. 6. Every day 10 a.m. – 5 p.m.
15. 6. – 31. 8. Every day 10 a.m. – 7 p.m.
1. 9. – 13. 10. Every day 10 a.m. – 5 p.m.
14. 10. – 3. 11. Saturday, Sunday, holidays 10 a.m. – 5 p.m.
4. 11. – ~28. 3. 2020 Closed, visit is possible upon prior reservation at the price for groups. In July and August we organize public transport to Javorca and back for 1,00 EUR per ride. The minibus (for up to 20 persons) will drive every Saturday and Sunday and on the 15th of August. Between the 24nd of June and 26th of August also on Tuesdays and Thursdays. From the 30th of June till the 2nd of September 2018 we also organize public transport for the visitors of the Tolmin Gorges, from Tolmin to the Tolmin Gorges and back. The price is 1,00 EUR per ride. The purpose of the organized transport is to relieve the road to Zatolmin village and the overcrowded parking lot at the Tolmin Gorges. High above the stream of the Tolminka rises a wooden shrine – the Memorial Church in Javorca.